LTHForum.com - Best Philly Cheesesteak in Philly? 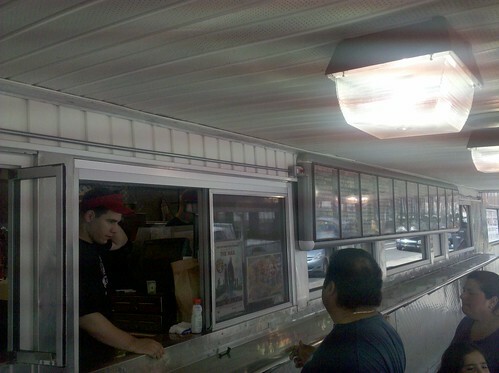 LTH Home > Chat > Beyond Chicagoland > Best Philly Cheesesteak in Philly? 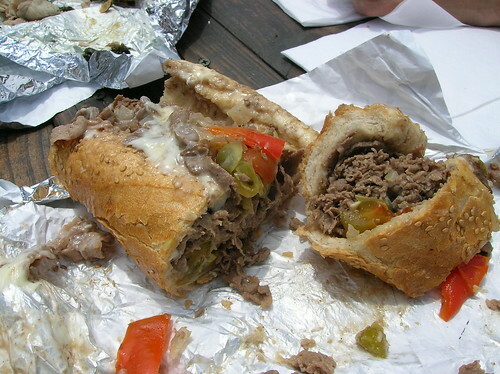 For those who have been to Philadelphia--any thoughts on the best cheesesteak? Is it Leo's? Jim's? Pat's? Chubby's? Someplace else? Look up Tony Luke's. Go to the original, which is conveniently under the expressway from Center City to the airport in S Philly. Though the pork italian is better than the steak, the steak's good. My wife hails from Philadelphia; we travel there often. I think you'll do better going out into the neigborhoods. Once you leave the orbit of the tourist eateries, Cheez-whiz disappears and prices drop a bit, too. Mama's in Bala Cynwyd and Garrett Hill Sandwich Shop in Rosemont are just two of the many places you can get a really good cheesesteak while avoiding the crowds and the hype. Unfortunately, I only had time to go to the big three - Pat's, Jim's, and Geno's. Of the bunch, I liked Pat's the best, Geno's second, Jim's last. I'm not even sure how one would improve upon a Pat's cheesesteak, as it was simply perfect. Pat's and Geno's are also located at the end of an awesome Italian market on 9th Street. I would say go to some of the smaller places, but do hit the original (Pat's King of Steaks), and take a stroll north on 9th street and check out all the vendors with their sausages, cheeses, seafood, bread, etc... I picked up some of the best aged provolone and soprasetta I've ever had on 9th. "John's Roast Pork" is new to me (altho apparently it's been around since 1930), but it's recently got some attention lately (with a recommendation from the NY Times) and as a recent winner of a local survey for the best cheesesteak (and supposedly a helluva pork sandwich, too, a strong competitor to Tony Luke's). It seems to be just off of 95 on Snyder Avenue. I can't speak from personal experience, but I've got it on my must-try list for my next trip to Philly. More info here. It's been about a year since I had a philly in Philly but I doubt things have changed much. I would have to suggest that you avoid Pat's and Geno's altogether. I feel both places now cater to tourists more than other joints around town. I was severely disappointed with both when I returned to Philly for my cousins wedding. I would recommend the food carts around town. My cousin recommended them and I thought those were head and shoulders above Pat's and Geno's. Pat's and Geno's gave me 4 thin slices of meat, provolone cheese, and a what seemed like a teaspoon of grilled onions. I was in such disbelief, I stood at the Pat's window for some 30 seconds before they yelled at me to get out of the way. A friend's friend recommended Jim's, saying it was his favorite, but we didn't go there. Even without eating there, I would recommend Jim's over Pat's and Geno's. That last experience was just awful! I recently went to Pat's, Geno's, Tony Luke's, and Delassandro's. I was unimpressed by all of them. And while I expected to like provolone better than Wiz, because there's so little provolone on a sandwich and often not melted into the meat, I think Wiz might be better. It adds some creaminess and salt. Pat's Wiz, for whatever reason, was the best tasting. I don't know if they doctor it up, make their own, or what. I also think onions, because they're not actually caramelized or even browned much, don't add to the experience. I thought Tony Luke's bread, which they make themselves, was the best, although a bit dry. I did like the cheese fries on average and I would have liked to try some of the other sandwiches. I just think the authentic cheesesteak, based on these examples, is a lesser form than what people have done with it elsewhere. I was in Philly last spring and unfortunately was limited by work hours and lack of transport to the downtown area so I can't opine on the whole debate on who has the best cheesesteak. However, if you are downtown in the Center City area, you should stop by Reading Terminal Market on 12th and Arch or thereabouts. An open air farmer's market in the same vein as Granville Island in Vancouver or St. Lawrence Market in Toronto, it has lots of great local produce and food products along with several restaurants and cafes. On my last day in Philly, I had the roast pork sandwich from DiNics, and it was similar to what I would imagine Tony Lukes to be, a thick roll filled with savory roasted pork au jus, a pretty strong sharp provolone and in this case, spinach sauteed in garlic with giardinara. I ate it on my way to the airport and let's just say it was a gift that kept on giving all the way to Chicago. My wife claimed that she could still smell the garlic emanating from my clothes when I got home. I'll second the pork sandwich at Tommy DiNic's in Reading Terminal, awesome sandwich. Similar to our Italian Beef, you need to take a shower afterwards it's so juicy. The pork sits in a thin gravy till they slap it on the bread. Get it with brocolli rabe and provolone. I'd also take a pass on Pat's or Geno's. Talked a Philly friend into a guided tour of his favorite cheesesteak places. We did John's Roast Pork, Rick's in Reading Terminal and George's in the Italian Market section. IMHO, John's was the best, due in no small part to the outstanding bread which was crispy on the outside and loaded with sesame seeds. The shot of hot sauce under all the meat and cheese added a great boost of flavor. Rick's was a good sandwich, but the Reading Terminal was the real star. This is a food-lover's paradise, whether you are picking up and taking home or just spending a whole day in full-nosh mode. It was like LA Farmers Market, but indoors. We went for the cheesesteak, but came away with 9 pounds of Lebanon Sweet Bologna and 2 pounds of thick-sliced pepper bacon. We had to buy a suitcase just to lug home the food. Our last stop was going to be Willie's, until we discovered that Willy has retired. Fortunately, George's also serves a tripe sandwich (the Philly nut wanted this) and we had our last cheesesteak there. Okay, but not as good as John's (or Rick's). John's has the best cheesesteak, but Reading Terminal is the place to go if you want to really hurt yourself by eating everything in sight. jimwdavis wrote: Reading Terminal is the place to go if you want to really hurt yourself by eating everything in sight. Next time, try the "Italian Pulled Pork" at DiNic's -- possibly even better than the roast pork. Doesn't really need any accoutrements, but you can add sharp provolone and greens (spinach or rabe), if you wish. Beautiful sandwich, either way. The hoagies at Salumeria are also excellent and Termini Bros. has very nice Italian pastries. But I'm usually too porked out to try anything else. I lived in Philly until 5 years ago, and I've eaten more cheesesteaks than I could possibly hope to remember. It's hard to say which is the best since it's really a matter of choice, kinda like hot dogs in Chicago. People come here and go to Portillo's to get a 'Chicago hot dog', and although Portillo's is by no means bad, most people would say that their local place is better. It's the same thing with cheesesteaks. Not many people in Philly would say that Pat's is their favorite. But that doesn't mean they aren't good. Also, Geno's & Pat's are not JUST tourist traps. The shtick they do is real, if maybe hammed up a bit on weekends when the tourists are in. I've had a friend of mine tossed out of line on a busy Friday night at 3:00AM (many of the original places are 24hr joints) because Pat's is packed and he couldn't make up his mind after a few seconds at the window! That being said, my favorite would have to be the Original Jims on 62nd street in West Philly. The griddles are over 60 years old, and have been seasoned amazingly by countless number of steaks they've cooked over the decades. Pat's is also good, and Momma's steaks are pretty incredible as too. Also, always get onions, and always ask for american cheese (usually assumed) unless you are at Pat's or Geno's, in which case you should get whiz. John's has the best cheesesteak, but Reading Terminal is the place to go if you want to really hurt yourself by eating everything in sight. Sorry to state the obvious, but for the benefit of the uninitiated, the caption refers to the name of the place -- you're looking at a cheesesteak. The sesame seeds are noncanonical. The sweet peppers is how I likes it. 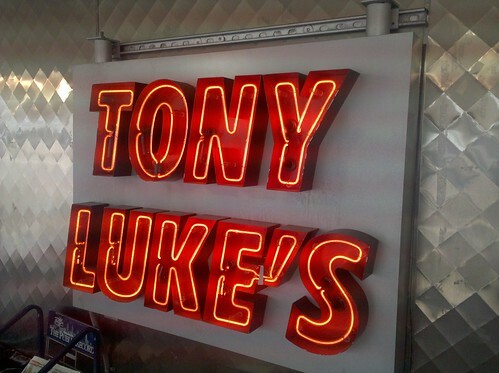 JeffB wrote: Look up Tony Luke's. Go to the original, which is conveniently under the expressway from Center City to the airport in S Philly. Though the pork italian is better than the steak, the steak's good. I did a 6 hour roundtrip flight to Philadelphia just to try the cheesesteaks, I tried Pat's, Gino's and Tony Luke's. WTF is up with the cheez whiz?!!?? I thought surely it couldn't be the same crap served on nachos but it is, stay away. Cheesesteaks were so-so, agree with the above to stay away from Pat's Gino's. The roast pork w/aged prov cheese, and broccoli rabbe is the way to go!! He's a bit of a Cheesesteak authority... among other foods. I'll put in a vote for Tony Luke's, which we had this last week on our driving vacation (yeah, we were all over the place). I'd had Jim's previously on South Street, and TL's grealy outclasses. We only had the hungers to split one Cheesesteak with American. The tubs of cherry peppers and pickles in the eating area area nice touch. But the main difference is the bread: right balance of crust and chew for the steak. Still, I prefer an Italian Beef with a good giardinera any day of the week. Note: I don't know about all GPS units, but the 2008 Hyundai system puts Tony Luke's east of the highway, when 39 Oregon is just west. 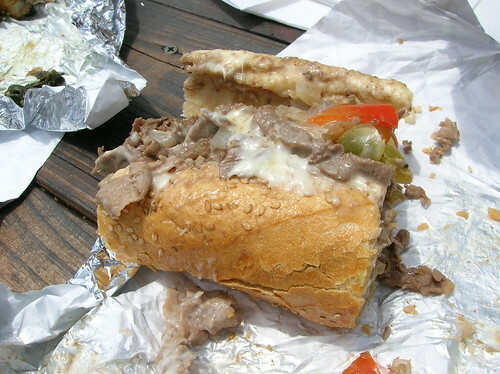 Disagree if you must as to who has the best cheesesteak, Pat's or Geno's. Moot point as far as I am concerned, distinction without a difference, tallest midget in the world........ On a recent late eve in Philly both were horrid, less than the sum of the parts, and the parts weren't all that good. zim wrote: Denic's in the market is also pretty good for pork, though they use spinach rather than the rabe I prefer. They give you a choice of either spinach or rabe. Dinic's had rabe last week and it was terrific with a capitol T.
Been 3 times, and Dinic's was indeed out of rabe once. A significantly inferior sandwich with the subbed-in spinach, I agree. 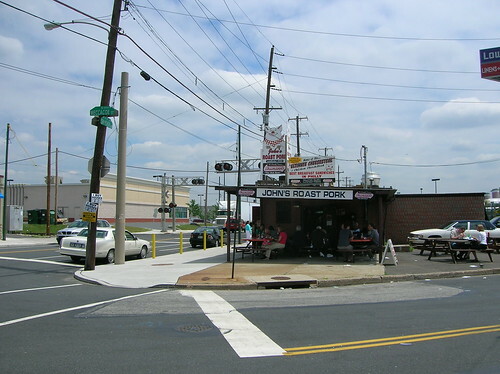 John's Roast Pork, a Philadelphia must-stop. Though a recipient of a James Beard American Classics award in 2006 John's Roast Pork is off the radar of most tourists, and a surprising number of locals for that matter. John's roast pork w/spinach and provolone, one of the top sandwiches of my sandwich eating life. In speaking with a food obsessed local I got an essential John's Roast Pork tip, always order a large, they use different bread for the small sandwiches, and the crisp sesame seed studded rolls are key. I am going to Philadelphia on business this week (Wilmington, DE actually) and this is my first Philly trip. I was hoping for advice for where to get the absolute best, most classic philly cheesesteak. I tried to search this, but didn't find any clear answer...so any help would be welcome. Isn't this sort of like asking where to get the best pizza in Chicago? When you get that clear, definitive answer re the single best steak in Philly, please post on it. Where are you eating in Wilmington? Pat's King of Steaks and Tony Lukes (personal favorite) are pretty much across the street from one another... East Oregon Ave? right around there. "Best" is a matter of preference but surely both will give you an idea of the standard by which the Philly Cheesesteak is measured. Unbridled4 wrote: Pat's King of Steaks and Tony Lukes (personal favorite) are pretty much across the street from one another... East Oregon Ave? right around there. "Best" is a matter of preference but surely both will give you an idea of the standard by which the Philly Cheesesteak is measured. Pat's and Geno's are across from each other at Passyunk and 9th. Tony Luke's is a couple miles away on Oregon right under I-95.